Takshila Learning providing Online Banking Classes & one of the most desired e-learning platform among the students and fastest growing educational company in India. Offering an Education Kit for the students preparing for Banking, SSC, RRB, & Current affairs and other competitive exams, the content can be accessed Anytime Anywhere, Any device. We are providing preparation Kit to the students through a 24X7 online platform, easy-books (360-degree movable touch screen educational laptop), tablets, pen-drives and SD cards. The Educational Kit in this segment bundled with HQ videos- animated and recorded, unlimited questions and tests, e-book, live support systems, personalized guidance, webinar and lots more. 1. How Takshila Learning online banking course is helpful for me to crack any bank entrance exam? Takshila Learning online banking course covers everything that is required to crack any Banking exam. We have divided our whole content into 5 modules that cover each & every topic from basic to advanced level with the help of video lectures. We recommended you to watch each & every video carefully & then attempt topic wise tests and finally attempt online test series with performance analysis. Webinars and one on one interaction on a regular basis with our faculties will further help you to clear your doubts. 2. Can I watch demo videos of the course? Yes, you can watch free demo videos of each subject from our website. If you like our course, then you can buy the basic or advanced package as per your requirement. 3. How many times can I watch the videos? Do I need an internet connection for it? The videos lectures can be watched unlimited times in the given validity period & you do not require any internet connection for watching them. 4. What is the validity of the course? You can watch these videos unlimited times for a period of 1 year from the date of activation of your course. 5. What is the difference between Basic & Advanced plan? In the basic plan, you will get the animated video content and 25 + recorded videos whereas in the Advance plan you will also get an additional 25 + conceptual videos from our experienced faculty. • Word of the days covering 500+ different words with their meanings to boost your vocabulary. • More practice papers to enhance your speed. • Webinars will be conducted regularly to clear your doubts. 6. Can I upgrade from Basic to Advanced plan later? Yes, you can upgrade from Basic to Advanced Plan any time by paying the remaining amount. 7. After payment, when my package will be activated? As soon as you make payment, we dispatch pen drive via courier & after you receive it, we will provide login-id & password so as to get access to the videos. 8. Can I access this course on mobile? Yes, you can access our course on any device like Smartphone, Laptop or PC. 9. Can I copy the content/videos? You will be given user-friendly software that is encrypted and copying / recording / downloading it is forbidden. 10. Still, have more doubts, how can I clear it? Our representatives at Takshila Learning are always dedicated to assisting you. Feel free to ask us on 8076585748. We’ll try to answer your queries as soon as possible. 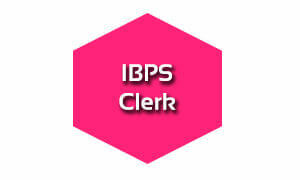 IBPS CLERK: Every year Institute Of Banking Personnel conducts Common Written Exam (CWE) for clerical cadre for different participating Public Sector banks and financial institutions. Graduate candidates of age group 20-28 years can appear in the exam to unlock the possibilities to work in India's leading banks. So, start your preparation with us through the dedicated and updated preparation kit focused on IBPS CWE. IBPS PO: Explore the opportunity to work with India's leading Public Sector banks and financial institutions at officer level with Takshila Learning. We offer 100% mapped content as per IBPS PO exam pattern with the facility to learn anytime, anywhere & any device. Every year IBPS conducts exam to fill the requirement of the various participating bank for graduate students of age group 20-30 years. RRB: IBPS conducts the examination for IBPS RRB for the Assistant & officers level post for the Regional Rural Bank. Get prepared for the RRB exams through our animated 2D/3D and recorded videos bundled with complete preparation kit. Our contents in this segment get updated on monthly basis. For this aspirants must have knowledge of the regional language of the region for which he/she opts to work in the examination form. SSC (Coming Soon): Staff Selection Commission - Combined Graduate Level Examination, often referred to as SSC CGL, is an examination conducted to recruit staff to various posts in ministries, departments, and organizations of the Government of India. Recording of videos and preparation of study material for SSC exams are under process. Register to know the launch date and avail an early bird discount. SBI CLERK: Join us to discover the opportunity to work with the India's largest and the most trusted bank. Graduate candidates of age group 20-28 years can opt for this post. Prepare through high quality animated and recorded lectures with focused preparation kit inclusive of e-books, test papers and etc. SBI PO : Join us to discover the opportunity to work at Officer Level in the India's largest and the most trusted bank. Graduate candidates of age group 21-30 years can opt for this post. Prepare through high quality animated and recorded lectures with focused preparation kit inclusive of e-books, test papers, live webinar, etc. 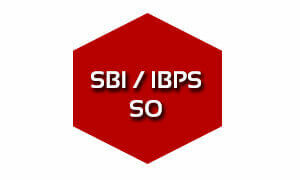 IBPS /SBI SO: Join us to discover the opportunity to work with the public sector banks in the field you hold specialization. Candidates with desired skills can prepare through high quality animated and recorded lectures with focused preparation kit inclusive of e-books, test papers, guidance from experts, etc. 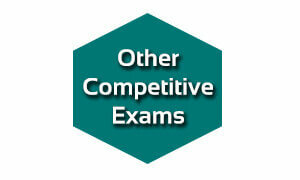 Other Competitive Exams: Every year vacancies in PSUs, Regulatory Bodies, Government Departments notified for the various job roles. Offering animated and recorded classes for various competitive exams like CTET, RRB, Railway Apprentices, IB, FCI Assit. GR-III & CPO. Register to know details of the course.